Over the past 35 years in business, The Refinishing Touch has been proud to provide sustainable and fiscally-responsible furniture asset management services to some of the largest, most well-known hotel corporations, including the Hilton, Hyatt, Best Western, IHG and more. From our work, we’ve witnessed firsthand the tremendous progress in sustainability and environmental leadership throughout the hospitality industry – from the smallest gestures, like adding more easily-accessible recycling bins, to larger-scale initiatives like the construction of green roofs and solar panels. Recently, the Global Sustainable Tourism Council hosted a conference where individuals and businesses alike shared this one common goal – making the world a better, greener place. Held in New Jersey, the conference highlighted the major trends and achievements in sustainability both in the city and worldwide. With these figures in mind, it’s important that property managers think outside of the recycling box, when attempting to further sustainable practices. For example, when undergoing renovations, one should think twice before buying new furniture in an effort to help prevent wood from making its way into landfills. Not only will The Refinishing Touch’s refinishing, re-upholstery and remanufacturing help reduce the amount of waste, but it will also lessen a property’s carbon footprint and prevent deforestation. Operating a sustainable hotel is not only beneficial to the environment; it is also a low-cost way to capitalize on short- and long-term ROI. By up-cycling furniture assets, one can save up to 80 percent in renovation costs – a critical factor when faced with the increasing number of budget cuts. While some may view ‘green tourism’ as a pricey goal, it is now more cost-effective and attainable than ever before. For more information on The Refinishing Touch and its refinishing, re-upholstery and remanufacturing in the hospitality, government and higher education housing sectors, please visit our website or listen to an audio overview here. Last week we were honored to be invited to the Wyndham Group Hotel Conference held in Las Vegas. Much like our trip to HD Boutique in Miami, we enjoyed the locale -of course, but were fortunate enough to learn a thing or two from one of the largest hospitality brands in the world. As the first all brand global conference in company history, we expected a lot of news, and we were not disappointed. One of the major announcements made was that Wyndham will now franchise the Planet Hollywood brand hotels and provide management services around the globe. The agreement with the entertainment-focused hotel will give Wyndham a broader appeal to a wider audience. Along with this, many of Wyndham’s 13 hotel brands will see alterations to its logos and websites to strengthen and better market its worldwide appeal. Without question, the best news coming out of the conference however was the Wyndham Hotel Group’s commitment to donate $100,000 to the Starlight Children’s Foundation. With this contribution, seriously ill children and their families are provided entertainment, activities, and education to help cope with the uncertainty that serious medical conditions can bring. In addition, Wyndham has pledged to donate $1 for every “like” they receive from fans on its Facebook page, up to $60,000, through November 30th. 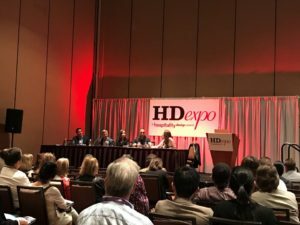 The upbeat nature of the conference was apparent as almost everyone had plans for what to do not only as a whole, but for their individual hotels as the hospitality industry continues to rebuild. And with over 5,000 owners, general managers, and staff in attendance, there was no shortage of ideas being passed around. We’re proud to have been a part of that exchange and are even more proud to work with a respected brand within the industry that has continued to give back.